E.A. Smithe is a reclone; he was an author but he died. The library system brought him back to life, as well as many other authors, poets, and artists, and they loan him out to people for any variety of reasons. Collette Coldbrook needs him to help her solve a mystery; her brother and father have recently died under strange circumstances, and her most relevant piece of evidence involves one of Smithe's books. 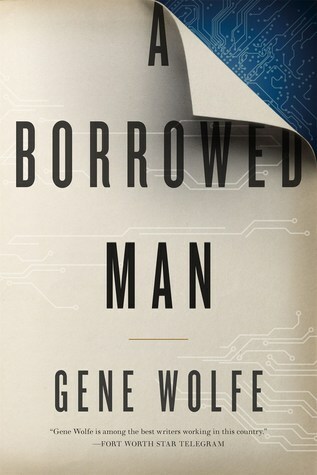 A Borrowed Man deftly blends a futuristic setting with a noir style. Collette and Smithe are pursued from the start by unknown individuals who may have been involved in the Coldbrook family deaths, or may be trying to collect on her father's debts. Smithe isn't treated like a "full human" because he's a reclone, so the story has a lot of elements of "what makes a man?" blended in with the central mystery surrounding the Coldbrook family. Complicating the story, Smithe was recloned from a point before he wrote the novel Collette has in her possession, so he doesn't particularly know its significance either. When I started it, the story sank its hooks in deep. But halfway through, it loses the plot. The story is told from the perspective of Smithe looking back at the events of the past, so when a significant character goes away, we (the readers) lose a valuable point of view. Without them, Smithe is almost robotic in his behavior. His programming takes over and he starts doing things that take us away from the mystery. It eventually gets back on track, but there's a strong feeling of lost momentum. The conclusion is satisfactory, but it has a lot of knots and a fair amount of handwaving. I spent a lot of the second half of the book scratching my head. I couldn't tell where we were going or why. The strong start convinced me to see it through to the end, but it shouldn't have nearly lost me in the first place. It's a net positive, but barely.